Help! My beardies have bone diseases, New Farm Vet. 3 types of bearded dragons are commonly kept in Australia; the Eastern Bearded Dragon (Pogona Barbata), the Pygmy Bearded Dragon (Pogona henrylawsoni) and the Central Bearded Dragon (Pogona vitticeps). Bearded dragons love the sun and it isn't uncommon to see them basking on the road side, on your fence posts or on large rocks in your garden. They are docile and gentle animals and relatively easy to care for. They are rather flighty, so if you're keeping one as a pet, be mindful of open doors, windows or if they're in the presence of other pets. Help! My dragons have metabolic bone disease, New Farm Vet. 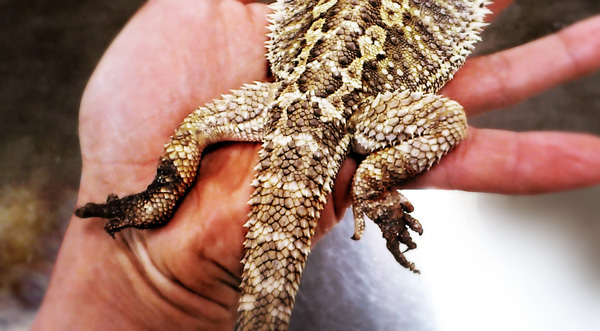 Most diseases affecting Bearded dragons can be traced back to husbandry problems so it pays to research on their requirements. Bearded Dragons are omnivores and diet is similar for all 3 species. Crickets and cockroaches are their preferred meat supplement while leafy greens and sprouts provide a suitable source of vitamins and minerals. They are prone to Metabolic Bone Diseases and resulting limb fractures due to low bone density. Supplements that contain Calcium and Vitamin D3 can be given to prevent MBD. Another method is to "gut load" crickets (or their food supply) by raising the insects on insectivore mix food and then dusting them with calcium. It is also important to provide adequate UV light to the dragons daily for calcium absorption. Natural sunlight that is not filtered through a window or glass enclosure are ideal if not, special UV lamps can be used. Inadequate supply of water can also lead to development of Gout - uric acid crystals depositing in joints. It is essential to provide water that is clean and not soiled by faeces or food. Elevate the water bowl if possible. As with other reptiles, bearded dragons are cold blooded animals and require heat to carry out normal metabolic functions. The enclosure should have a temperature gradient that allows the dragon to seek out warmth when needed. Regularly check the heat source such as heating pads and hot rocks to ensure that they are working properly. Thermal burn wounds take weeks and even months to heal. Suitable substrate and structures in the enclosure must be provided to help prevent skin diseases such a dysecdysis (problem with sloughing). Be careful when you keep two Beardies together. Fights are common especially between males, and can result in bite wounds and fractures. When Bearded Dragons are well taken cared of, they can live up to 15 years and provide you with lots of company. And remember, all reptiles are protected by Australian law and prohibitions generally exist against the collection of reptiles from the wild. Legal requirements vary from state to state so please check out with your State or Territory National Parks and Wildlife Service.